Thanksgiving is upon us, which means many of you may be wondering which Thanksgiving flowers would be perfect to decorate your Thanksgiving dinner table with. We were contemplating this very thing, so we thought we’d put together a guide to festive flowers for this special holiday. We’ve highlighted a few of our favorite Thanksgiving flowers, all of which would look stunning at a casual Thanksgiving dinner or a full-blown elaborate affair. The Thanksgiving flowers that we’re suggesting for you will surely look beautiful at your holiday celebration, whether you eat on Thanksgiving-themed paper plates or fine china. Since we’re guessing you might have quite a bit of planning left to do for your Thanksgiving dinner, let’s get right down to our guide to Thanksgiving flowers for 2016. Enjoy finding out about some of the most popular flowers for the holiday, and enjoy your Thanksgiving! Yellow carnations are fun and festive. They bring cheer to any gathering, so feel free to bundle some up on their own or combine them with some greenery. We love yellow carnations placed in a low glass vase, either loosely or bound tight to resemble a ball of flowers. 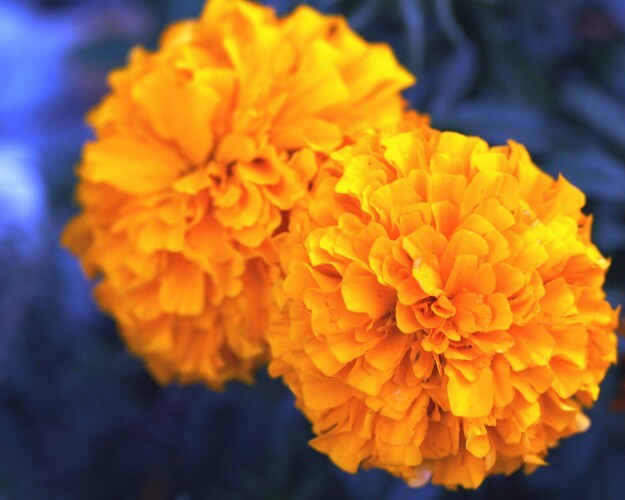 We think yellow carnations look fabulous enough to be the stars of the show on Thanksgiving, but if you want to pair them with other flowers, consider red and orange carnations. Again, Asiatic lilies are gorgeous for the holidays. They can look spectacular on a low-key or dramatic Thanksgiving table, on their own, paired with other flowers, or mixed with a bit of greenery. We recommend you opt for yellow, orange, or red Asiatic lilies in monochrome or mixed arrangements. Place them in tall vases to show off their beautiful stems. If you want to display Asiatic lilies without greenery, they’ll look incredible, no doubt. But, you can always mix them with millet greens or Irish millet greens to bring a bit more texture to your table. 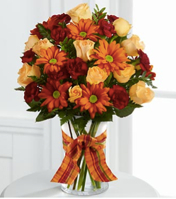 Orange daisies set the tone for warmth and friendship at a Thanksgiving dinner table. An arrangement made with these flowers can be low or tall, and it can include greens or not. Either way it will be just perfect for your Thanksgiving centerpieces. You can use butterscotch daisy pompons or larger gerbera daisies. For a bit of flair, feel free to wrap your Thanksgiving daisy floral arrangements with shimmery orange, pearl, or gold ribbon. 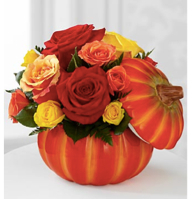 We think that these three flowers are “must includes” on a guide to Thanksgiving floral arrangements. But, we know there are many other exquisite flowers that would make equally wonderful points of interest. As you’re thinking about how to adorn your Thanksgiving table, simply choose flowers that make you feel good about sharing a meal and a home with others. That’s probably the best approach to your celebration. Thanksgiving is upon us, which means many of you may be wondering which Thanksgiving flowers would be perfect to decorate your Thanksgiving dinner table with. We were contemplating this very thing, so we thought we’d put together a guide to festive flowers for this special holiday.We’ve highlighted a few of our favorite Thanksgiving flowers, all of which would look stunning at a casual Thanksgiving dinner or a full-blown elaborate affair. The Thanksgiving flowers that we’re suggesting for you will surely look beautiful at your holiday celebration, whether you eat on Thanksgiving-themed paper plates or fine china.